Clear water handling for domestic use. Assembled with pressure vessels for pressure boosting in various applications. Boiler feed (the PSA series is specially indicated). 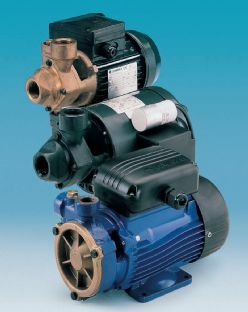 P/PAB series with front suction and radial delivery. Delivery up to 3.0 m³/h. Maximum temperature of pumped liquid: -10°C to +40°C. Enclosed motor with internal ventilation through casing for series P (P16 P21 P30 P40) pumps enclosed with external ventilation and aluminium alloy casing for (P60 P70) PSA and PAB PABLB series pumps..
Carbon/ceramic/NBR seals fitted as standard.